Pendulum, Amethyst, with Crescent Moon + GemBeads8-faceted Amethyst Pendulum Point with Amethyst and Quartz Beads, mounted on Sterling Silver Chain with Sterling Crescent Moon Charm. 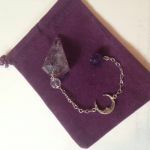 Description: 8-faceted Amethyst Pendulum Point with Amethyst and Quartz Beads, mounted on Sterling Silver Chain with Sterling Crescent Moon Charm. Every pendulum includes a free violet pouch. Every pendulum is shipped immediately via 2-3 day Priority Mail. Not in the contiguous 48 US states? That's okay. We ship worldwide and will quote your international shipping options upon your order's receipt .